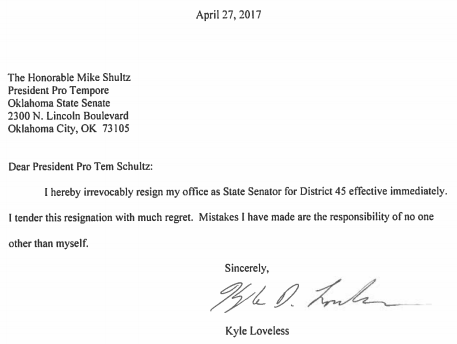 State Sen. Kyle Loveless (R-OKC) abruptly resigned today, amid investigations by the Oklahoma Ethics Commission and Oklahoma County District Attorney's office into possible campaign finance violations. Loveless was first elected in 2012, and had made civil asset forfeiture reform his primary mission in recent years, getting major opposition from some in the law enforcement community. This becomes the fifth resignation in the legislature since the 2016 general election; State Rep. Tom Newell (for a private sector job), State Rep. Dan Kirby (sexual harassment allegations), State Rep. Scott Martin (for private sector job), State Sen. Ralph Shortey (child prostitution arrest). State Rep. David Brumbaugh's sudden passing creates another vacancy requiring a special election.